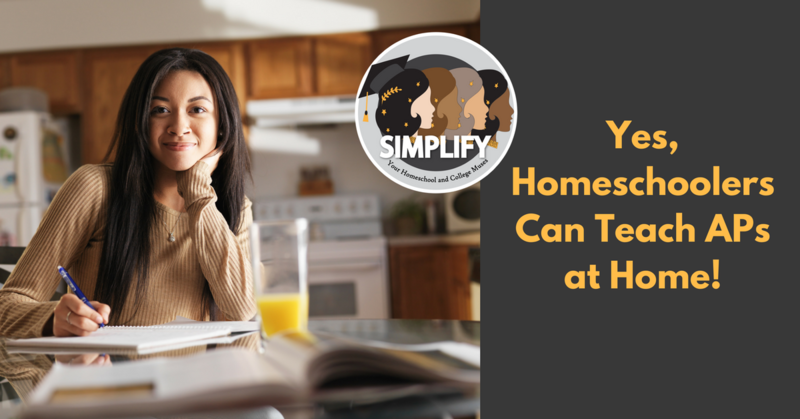 Yes, Homeschoolers Can Teach APs at Home! When it is time to homeschool high school one thing you may be considering is AP classes. AP classes have the potential to help your student stand out when it is time to apply to colleges and will demonstrate to colleges that your homeschooler challenged themselves with rigorous classes. Students with AP scores are also granted college credit at many universities which is a benefit that cannot be overlooked. As wonderful as AP courses sound they can also be cost prohibitive to many families. Online courses can run anywhere from $600 to over a $1000 and this often doesn’t include books, lab materials, and the cost of testing through the College Board. For many homeschool families this cost is just too much and therefore APs do not become an option. What many homeschool parents do not realize is that you can get a syllabus approved by the College Board that allows you to teach an AP course and designate the course as AP on your student’s transcript. This process is called AP Course Audit and it is something that homeschoolers have access to should they want to take advantage of it. The key to this process is the syllabus. An AP syllabus needs to cover everything that is required in an AP course as laid out by the College Board. An addition to a syllabus you will need to submit an AP Course Audit form. To do this you will have to create a teacher account at the College Board. You can read more about the process here. The process can be somewhat tedious and it will take time. Time to get your account formed, time to create a syllabus with the required material, and time to have it all approved. But once it is approved, it allows your student to experience an AP course without the high cost of what many outside providers charge. This is a wonderful benefit to many families and one that should be considered if you want your student to have AP classes listed on their transcript. For more information please visit the AP Course Audit page. If you would like help with this process please contact Simplify here. One of our knowledgeable muses can take you through the process to ensure that your syllabus is approved. And if you need even more help, we can create an AP-approved syllabus with you.